HomePink EyeWhat Is A Good Pink Eye Treatment? Have you ever had Pink Eye? If you have, you know the crazy itching and soreness that comes with it. What can you do about it? What is a good Pink Eye treatment? Pink Eye Treatment: What is Pink Eye? All these symptoms can be very irritating, as well as painful. 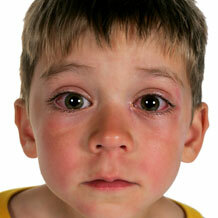 Many times it’s a child that needs Pink Eye treatment, and it can be very intense for all involved. As a former teacher I have seen Pink Eye sweep through a classroom like a flood. It’s highly contagious, and when the symptoms show up it’s obvious what’s happened. Pink Eye Treatment: What Causes It? The Pink Eye treatment you need may depend on the type of Pink Eye you have. You can sometimes treat the symptoms, and other times you can treat the cause. As stated earlier it is spread mostly through contact, so another “cause” could be the person next to you. The treatments we have are affective. 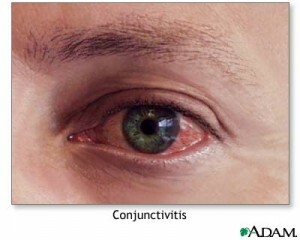 Various forms of Conjunctivitis can be treated by one of the few Pink Eye treatment we have. As stated, the treatments are based on the type you have. Viral is a different treatment from Bacterial, which is different from Allergic Conjunctivitis. This Pink Eye treatment is used in treating mostly Bacterial Conjunctivitis. Usually a couple of drops, several times a day for 3-5 days, will alleviate the symptoms. Here is one of the types of Pink Eye that requires you treat not only the symptoms, but the cause. Without treating the allergy, you will not completely eliminate the possibility of the Conjunctivitis returning. This is not so much a treatment as a comfort measure. With Pink Eye comes the burning, itching, and sometimes crusting of the eyes. Placing a cool or warm compress on your eyes when symptoms show up can help relieve those symptoms. Some Pink Eye can’t be treated by any known method; it simply has to go away by itself. You can treat the symptoms, but it may take from 3-5 days to see improvement. Perhaps the best Pink Eye treatment is to prevent it from ever happening. There are several steps you can use to prevent you, and those around you, from getting Pink Eye. You can even prevent others from passing it on to you by taking a few simple preventative measures. These are all proactive, personal steps that you can take to prevent Pink Eye. To keep from needing a Pink Eye treatment wash your hands often, but especially as you leave your workplace or school, and then again as you get home. Stopping the “infection highway” is a very important part of preventing Conjunctivitis. That is a fairly simple question. First try and prevent it. If that doesn’t work pick the best Pink Eye treatment that fits your particular type of condition. Be it Pink Eye drops or allergy medicine, either way it will take a few days for your Pink Eye treatment to fix the problem. True or False: Pink Eye has more than one cause. Which is NOT a Pink Eye preventative measure? With How To Cure Pink Eye Fast you can have that relief in as little as 72 hours. What Eros has put together is a comprehensive attack on Pink Eye of all types, starting with symptom relief in just a few hours. I recommend Eros’ book to anyone who has suffered from the irritation known as Pink Eye. Within minutes you could be learning about the cure that can start working its magic on your suffering within hours. How to Treat Pink Eye Pink Eye Pictures What Are Some of the Home Remedies for Pink Eye? How Long is Pink Eye Contagious? I guess it’s like most infections, you mostly have to wait for it to clear up on its own. Glad there are ways to make it less annoying though. I remember having it when I was a child. You can treat some forms of Pink Eye Carrie, depending on it’s cause. Most of the time it will resolve on it’s own,but if it is persistent, you would need to see a doctor. Thanks for the comments. Thanks for the testimony Emily. Sometimes people can be carriers of the condition and not know it. If you have any contact with that person, or a surface they touched, you can contract the condition; even if the carrier shows no sign. Yeesh! I went through several bouts of pink eye in the course of two years. I know I shouldn’t have, but I had a steady supply of eye drops to treat it left over from the last time I had it.